This EA trades using the Heiken Ashi Smoothed Indicator. It offers many trading scenarios and flexible position management settings, plus many useful features like customizable trading sessions, a martingale and inverse martingale mode. Boost your trading returns with the most flexible Heiken Ashi Smooth EA, like hundreds of users have already done! When loading the indicator or EA to any chart, you will be presented with a set of options as input parameters. Don't despair if you think they are too many, because parameters are grouped into self-explanatory blocks. This parameter group holds the Heiken Ashi Smoothed settings. Enable or disable trading setups and directions. Enable or disable trading for the Assian, European or American sessions. This group of settings applies to trading decisions and trade management. You can select trading direction, break-even in pips, trailing-stop in %, trailing-step in pips, stop-loss in pip and take-profit in pips. Optionally, trades can be closed on opposite signals. In this settings block you can set the lotsize for the first trade, or allow the EA to calculate it by itself. It also implements a martingale behavior. Entering a manual lot size is recommended. You can select the magic number for the trades, custom comment and manual pip value if you need to override the one the default one. Do not change these unless you know what you are doing. Can I disable the stop-loss and trade it as a reversal system? Does the EA use tick data? No, it does not. It uses only HLOC data from the current chart. Keep comments tidy and respectful. Avoid spam, offensive remarks, self-promotion and posting personal or payment information. The comment section is for discussion and questions only. Please note that we'll never solicit payments in the comments section. 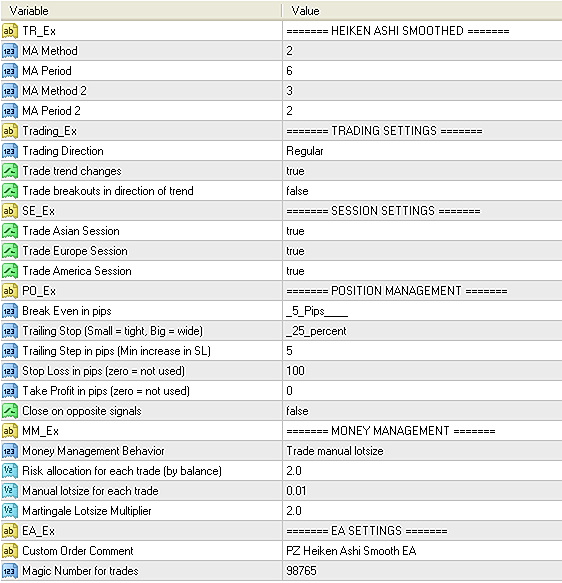 An automated implementation of the original Richard Dennis and Bill Eckhart trading system, known as the Turtle Trader. An indicator implementation of the original Richard Dennis and Bill Eckhart trading system, known as the Turtle Trader. Tired of plotting trendlines? This indicator applies a mechanical approach to the construction of trendlines. This expert advisor trades moving average crossovers with fully customizable trading settings and hours. This expert advisor trades the parabolic sar indicator with fully customizable trading settings and hours. This indicator displays simple buy or sell signals according to Bill Williams definition of trading in the zone. This customizable and flexible expert advisor trades according to Bill Williams definition of the Trading Zone. Customizable expert advisor that trades using the MACD indicator and donchian breakouts. Flexible expert advisor that trades according to the Ichimoku Kinko Kyo Indicator and offers multiple entry conditions. This EA trades according to the ADX Indicator. It offers flexible entry strategies and position management. Custom implementation of the famous super trend indicator, with scanner, dashboard and alerts. This expert advisor trades the super trend indicator with fully customizable trading settings and hours. Simple indicator that implements the higher high, higher close, lower low, lower close trend confirmation principle. Custom implementation of the bollinger bands indicator as a trend following mechanism, with alerts of all kinds. This indicator signals fractal breakouts and plots the fractal channel on the chart. Implements alerts of all kinds. This expert advisor trades the bollinger trend indicator with fully customizable trading settings and hours.